Co-chair of the 40th Independence Anniversary Committee Tracey Thompson read the 40-Day Countdown Proclamation by Prime Minister Perry Christie for the 40th Anniversary of Independence of The Bahamas. 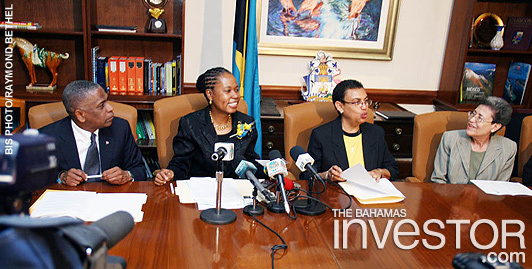 Thompson read the proclamation during the official launch of the 40-Day Countdown to the 40th Independence Anniversary at the Office of The Prime Minister, Cable Beach, May 31, 2013. The proclamation states that Bahamians have come to view the attainment of independence from the UK on July 10, 1973 as the third part in a trilogy of historically significant national events to have taken place in The Bahamas after Emancipation and Majority Rule. The proclamation by the Prime Minister informs the public that there is an “intense schedule of events” planned and endorsed by the Independence Commission inclusive of National Colour Day and National Flag Day, which have been designed to facilitate the release of “nationalistic expressions and fervour”. 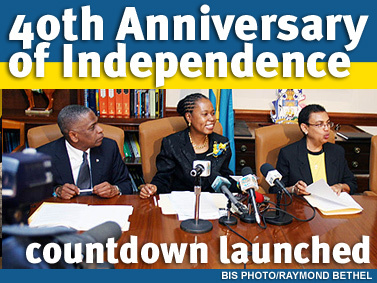 40th Independence Anniversary Committee member Arlene Nash-Ferguson said the event held May 31, 2013, marks the beginning of the official 40-day countdown to Independence 2013. The launch event is scheduled for June 4 at 6:00 pm in Rawson Square. participate in the Independence Calendar of Events. Celebrating more than four decades in business, Royal Caribbean International will be honoured for its investments in the Caribbean region during Caribbean American Heritage Month in New York City this month. The cruise company will be presented with the 2013 Invest Caribbean Now Corporate Leadership award June 5 at the Radisson Martinique Hotel.